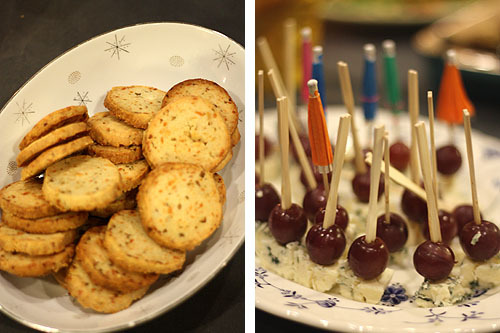 My cookbook club met last weekend and our book this time around was Gourmet Game Night: Bite-Sized, Mess-Free Eating for Board-Game Parties, Bridge Clubs, Poker Nights, Book Groups, and More by Cynthia Nims. I made pretzel sticks with three mustard dipping sauces. I lack proper serving bowls so I went with what I know, jars. Transporting dips in jars is ideal and even better is that at the end of the night you can take the dirty dishes home easily by simply putting the lid back on. You might recognize the jars above from some of my other projects: mug wraps I made for Real Simple, these held the optional cocoa mix, cobbler baked in jars and the big is from grapefruit tarragon infused vodka. You can find the full recipe for the pretzel sticks as well as the recipe for the Green Pea and Mint Spread with Crispy Pancetta over at Dishing with Cathy Casey and find a few other recipes over at the Gourmet Game Night website. 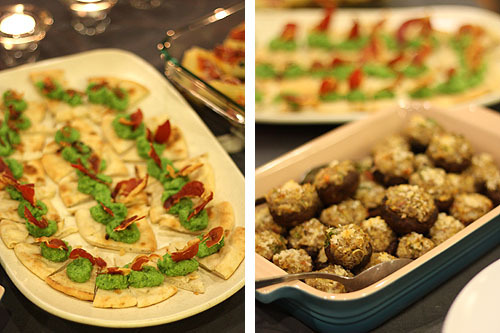 Green Pea and Mint Spread with Crispy Pancetta and Artichoke-Stuffed Mushrooms. The mint spread was surprisingly delicious. Olive and Cheese Crakers which I couldn’t stop eating, they are savory but tender like a cookie, and Pickled Grape and Blue Cheese Skewers. 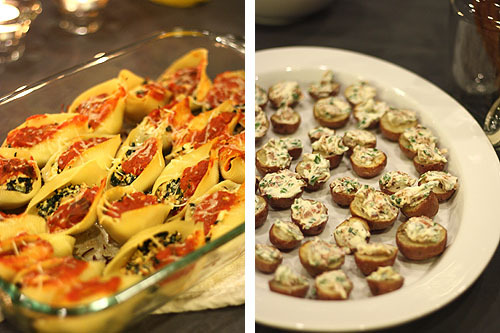 Stuffed Large Pasta Shells with Kale-Ricotta Filling and Roasted Red Potatoes with Bacon-Chive Creme Fraiche which I really loved, like itty bitty potato skins. We also tried Aged Cheddar with Dried Cherry-Almond Chutney which was great and Polenta Squares with Spicy Sausage and Spinach. Everything was easy to eat with fingers and little fuss, which was fantastic. I didn’t try any of the desserts and I forgot to get photographs of the drinks we tried, Manhattans with Spiced Cherries, Pomegranate-Mint Fizz and Key Lime Gimlets, all of which are made in pitchers making less fuss for the host or hostess. Looking through the table of contents I think I’ll also be trying the Spicy Meatballs with Yogurt-Cucumber Dip and Mini Shepards Pies in the future. Did we play games? Nope, our group was too large and we knew we would be have plenty to talk about. Instead we used this night as an excuse to put on our fanciest dresses and sparkliest jewelry which we all agreed we don’t get enough chances to wear. It was a huge amount of fun, thanks ladies! I highly recommend doing something similar, wearing your fancy clothes without necessarily needing to be on your best behavior is a huge amount of fun. I love these! And I’m totally stealing your sauce-in-jars-transport method. Ellen – I love jars for picnics too, you can screw the lids back on to take the dirty dishes home. CitricSugar – the mustards were so darn easy and the herbed one was delicious and I want it on a burger. I used regular dijon mustard but in retrospect wish I’d went and found some fancier mustard, I think a more delicate taste than Gray Poupon would help the flavors that are mixed in shine even more. Why on God’s green earth did I ever leave Seattle??? I miss you guys! I would never have thought to transport in jars. What an awesome idea! Noemi – The sunshine, darling. You went towards the light! We do miss you, kisses to you and your two sweet ladies. Steffy – I absolutely hate dragging home dirty dishes so covered casseroles and jars and the like are idea. Helen Jane I lurve it! gorgeous collection of small food! A cookbook club is the most genius idea I’ve ever heard. It would even give me a reason for when my husband asks why I need “one more cookbook”! I love it. Some gorgeous looking nibbles there – we’re planning our first ever cocktail party soon – so this will be a help! I found you through your interview on Suzy’s sitcom and had to come take a look after seeing the gorgeous pictures of your crafts! I’m going to explore your blog some more now! Whoa! 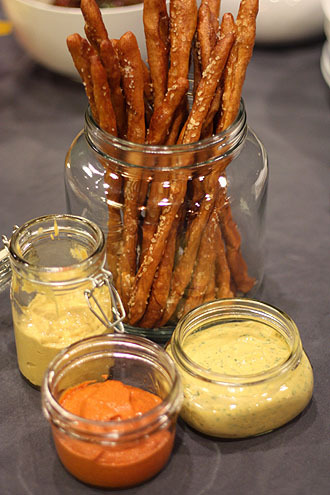 Offering fancy pretzels and mustard dips at a party is a very fun, very wallet-friendly way to entertain. I’m glad you shared this a week before my Super Bowl Chili Party! These snacks will make a great accompaniment to the main dish. I so loved these pretzels. I think I might have to make them so I can share them with more folks. A cookbook club!? My life is now complete. Genius! Reading this post before making dinner was an awful idea! Now I can’t get those pretzel rods with mustard out of my head and I would kill for a spicy meatball…. My cooking quandary aside, that jar idea is fantastic. You could even stick leftovers back in the fridge in the same container used to transport and serve! Ella – That is exactly what we did, and I made more pretzels the next day and used up the mustard that way.